Sunbiotics is honored to introduce our potent and purely formulated vanilla probiotic powder. Our proprietary formula is entirely food based, organic, and comes enhanced with jeruselum artichoke inulin and yacon root, both renowned for their prebiotic effect. We use zero fillers, flow agents, anti-caking agents, or additives of any kind. Our ingredients are low temperature processed to maintain nutritional integrity as well as ensure our live probiotic cells remain fully viable. We use real, whole vanilla bean for an authentic vanilla taste - no artificial or "natural" flavors. Our ingredients are simple, each offering a health benefit. No non-food "other ingredients" to skim through at the bottom. We list them all! Organic Yacon Root - a Peruvian root vegetable containing naturally occurring nutrients known as fructooligosaccharides that stimulate the growth and activity of probiotics (beneficial bacteria). Organic Jerusalem Artichoke - a tuberous root vegetable in the sunflower family with a high concentration of inulin, a non digestible plant fiber that helps support the growth of healthy probiotics in the gut. Organic Vanilla Bean - a time-honored aromatic spice with health benefits that has gained superfood status. Vanillin is an active found in vanilla which is a polyphenol with robust antioxidant properties. In addition to potent superfoods, each serving of Sunbiotics boasts 20 billion CFUs of 4 well-researched, shelf stable probiotic strains. Directions: Mix 1/3 teaspoon with water, juice, smoothies or your favorite meals. Note: Our probiotic strains are free of dairy, soy, GMOs, wheat, eggs, yeast, sugar, corn, carriers, artificial flavors and preservatives. 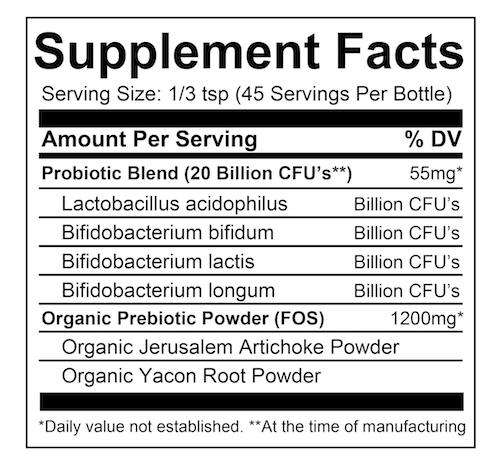 Raw Yacon Root Powder°, Raw Jerusalem Artichoke Powder°, Raw Vanilla Powder°, Live Probiotic Blend of L. acidophilus, B. bifidum, B. lactis, B. longum.